Whether you’re a craftsman or hobbyist, looking for quality edge banding can require an extra effort toward achieving the look and value of your final product. That’s why you should look to the professionals for their expertise and guidance in selecting the right width, thickness, and species. We at Sauers & Company Veneers can assist you with making those important selections! We offer edge banding in widths from 5/8” and up, which are available in various thicknesses with a species variety from Alder to Zebrawood. We also offer a line of Melamine with our most popular being black, white, maple, almond & grey. And, if it’s pre-finished you’re looking for, we’ve got that too! 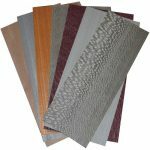 All our edge banding is available in various backing options. So, whether you’re interested in finding quality wood veneer edge banding, decorative inlays, or veneer sheets for your next project, we at Sauers & Company Veneers would like you to know about our services. We provide edge banding, decorative inlays, and veneer sheets to anywhere in the U.S. and worldwide. Our selection includes more than 125 species in 6 different backing options to choose from. The consistency of our products speak for themselves, and we are eager for you to notice our quality.